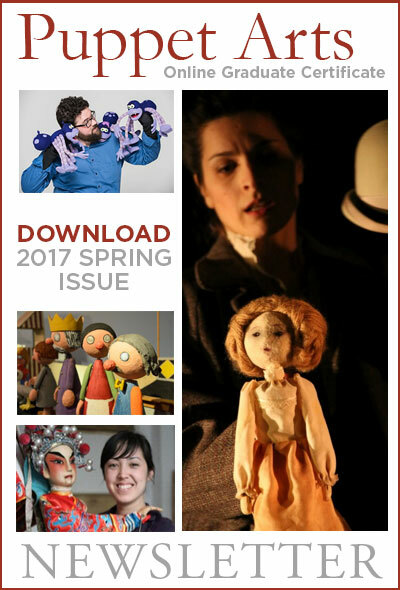 A 12-Credit Puppet Arts Online Graduate Certificate Program for the artists in all of us. Call it magical, mysterious, uncanny – there’s something about bringing inanimate objects to life that draws us all in – children and adults alike. There’s that moment – it happens without us even knowing – when we become totally absorbed by the scene playing out in front of us. Something innate in us as human beings want to see life where there is no life. No small wonder Puppetry has endured the test of time. 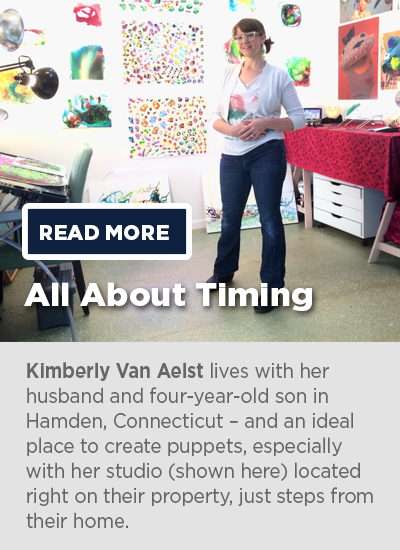 In fact, Puppet Arts has evolved over centuries, and today inserts itself – often invisibly – into all kinds of venues beyond traditional puppet theater, from major motion pictures, Broadway, and opera, to television, schools, sports arenas, and many other settings. The demand for skilled puppeteers who can work across all these disciplines is rising as puppetry becomes increasingly mainstream. So, you want in? Looking to up your puppetry skills – maybe jump headfirst into the world of puppet arts? We understand – after all, the University of Connecticut (UConn) is home to the premier graduate puppetry program in the United States and attracts artists from around the world. We also understand that for most working professionals, there are a few challenges to achieving your artistic goals, like the demands of a job, maybe kids – you know, life. 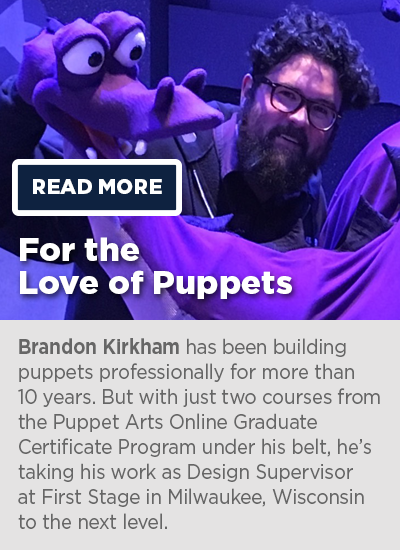 That’s why we now offer a 12-credit online graduate certificate in Puppet Arts, which brings the UConn Master’s curriculum into an online environment. You’ll get access to the same superb instruction, content, and faculty available to our graduate students – all from the comfort of your home, studio – wherever. In addition, you’ll get the connections to potential jobs within the world of puppetry that only a globally recognized program like ours can provide. Performing artists, including actors, dancers, and choreographers, looking to expand their repertoire. Directors, special effect artists, film makers, robotic engineers, musicians, and others interested in learning how to design and fabricate various types of puppets. Sculptors, painters, and writers who work in dramatic arts fields and need to develop a strong foundation in puppet performance, design, and fabrication. Educators and therapists looking to use puppetry to help children improve their communication skills, express their creativity, and deal with traumatic situations by creating a safe way for them to talk about uncomfortable subjects. A Bachelor’s degree is required. We are currently accepting applications for the fall 2019 semester. The deadline is Friday, June 14, p.m. EST. Apply now to avoid last minute processing delays!